My Great Uncle Raymond Schnozgoblet, the famous Victorian ghost hunter, used to take a tea of infused Feverfew before a seance….he said it kept the poltergeists from tying his shoelaces together. …well…where does one begin…Feverfew is a perennial and herbaceous in habit. Once the little charmer gets going she will return every year without fail and with very little in the way of attention. Very easy to please you might say. 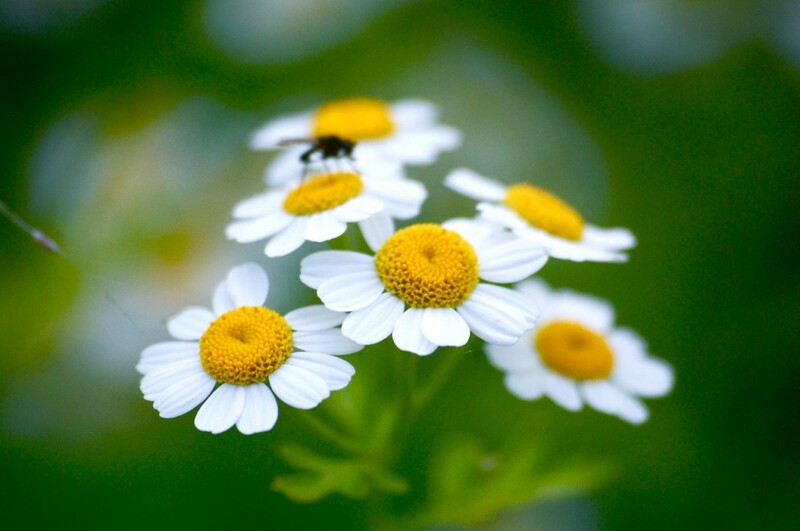 Feverfew will flower from July to October with daisy-like flowerheads 2.5cm across, white rays and yellow disk florets. The plant has a strong citrus odour and is one of the few flowers in the Higgledy Garden that the bees turn their noses up at…if indeed bees have noses…one presumes they do…otherwise their glasses would fall off. I am not a herbalist and am not going to advise you on taking Feverfew…do so at your own risk…it didn’t kill Uncle Raymond…he died when he tripped down the stairs after his shoe laces were mysteriously tied together. *I sow in pots of loamy soil…sprinkle a few of the dinky seeds onto the surface of the soil and tap the bottom to settle the seeds…use a fine mist spray to water them…pouring may dislodge the seeds. Don’t cover the seeds with soil as they need light to germinate. *Keep the pot somewhere sunny…like a greenhouse or window sill. *You should see some groovy germination action in about two weeks. *If you fancy you can outside directly where you want them, do this in early spring. Beginning of March is good I find…some sow in February. *Plant or thin out the seedlings to around 15 inches apart. *Make sure you sow/plant them in a sunny spot. *She is not keen on consistently damp soil. So there you have it. I shall be growing some from seed next spring and will keep you posted. If you enjoyed this post…and I jolly well hope you did…perhaps you may like to read about Ammi Majus, ‘What flowers to sow in Autumn‘ or perhaps you want the low down on ‘slugs‘? Choosing Perennials For The Higgledy Garden	Corncockle. 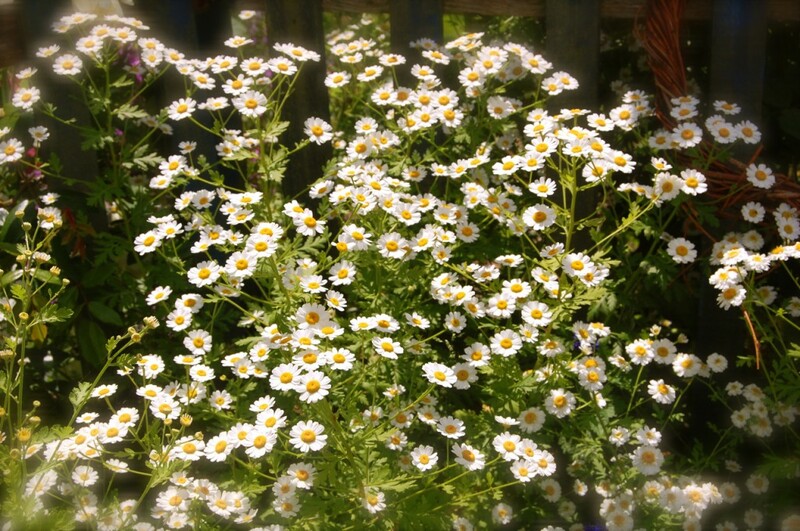 Dear Mr Higgledy, Feverfew is also intensely disliked by pesky wabbits! I found this out accidentally when the rabbits decimated a young blueberry bush except for the branches that were nestling up to feverfew. Since then I plant feverfew next to tender young plants and the bunnies don’t bother them. I often eat a leaf of feverfew when I have a headache – though some people say it can make their mouth sore, I don’t find this happens to me. I wouldn’t be without it in my garden.